Our Fall 2014 semester just wrapped up. I asked the students in my seminar to write a longer paper on our three philosophers – and then joined in the fun and wrote one myself. It would be said rightly that the rumors of the death of God are exaggerated, but it is true nevertheless that the traditional monotheistic belief in a divine person transcending the natural world and using it as some kind of means toward a beneficent and glorious end has fallen upon hard times. Back in the days when so little of the natural world was understood, it was easy to see extraordinary events and coincidences as issuing from the hand of God. In the days when everyone looked to some superior lord in both gratitude and fear, it was natural to ask who was the Lord of All. And in the vaulting cathedrals and darkened temples one did more than marvel at great historical architecture. Belief in a supreme, divine person fit naturally in our social structure and natural ignorance, so much so that arguably it may have been the only live option for our ancestors. It was obvious even earlier, at least to the 17th-century philosopher Benedictus de Spinoza. Spinoza had written a bold treatise charging that the Bible is “erroneous, mutilated, corrupt, and inconsistent, that we have only fragments of it, and that the original text of the covenant which God made with the Jews has perished.” Moreover, in his metaphysics, he argued for an impersonal divine substance that stood not above or beyond the world, but at its essential core, so that the names “God” and “Nature” were equally apt. He believed that his age, the early Enlightenment, was ready to take a huge step forward, transmuting Bronze Age superstitions into fully rational pantheism with the aid of the natural philosopher’s stone: namely, the new mechanistic sciences of Descartes, Huygens, Newton, and Boyle. These three thinkers provided natural alternatives to transcendent religious superstition. Beyond that, perhaps, the similarities end. Spinoza’s axioms and geometrical proofs were merely a “hocus-pocus of a mathematical form,” according to Nietzsche – “how much personal timidity and vulnerability this sick hermit’s masquerade reveals!” Emerson never came under Nietzsche’s scalpel, but his easy-going “child of the cosmos” routine expresses a temperament quite different from that of Nietzsche the aggressive idol-smasher. 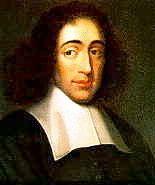 Spinoza would have only disdain for both Emerson’s poetic raptures and Nietzsche’s frequent sallies against the authority of reason. The three would not have got on well. But on the other hand – and with these three, there is never any shortage of other hands – the three might not have gotten along precisely because of their similarities. Like three estranged brothers, they begin at the same place and then make for themselves very different roads to very similar places. They begin with deep dissatisfaction in traditional religion. Then they travel by roads that are in turn in more geometrico, romantic, and nihilistic. And they arrive at places imbued with a reverence toward the natural – toward life, toward existence. Each philosopher celebrates there being something rather than nothing, and each voices, in his own way, a kind of gratitude for being. Each of these brothers had to take his own road to this destination; for what each of them sought was not solace so much as epistemic authenticity, the feeling that each knew for himself what was true, for he had gotten to the truth – his truth – on a path he himself had made. The tale of these three brothers might be organized under the headings of three questions they all faced: What is Nature? How does the answer to that question inform my life? And in these new visions, riddles, and answers, what older philosophies are being superseded and overcome? Emerson’s career starts with an essay on nature. On an initial reading, Emerson is simply praising the beauty and peace he finds in natural settings – “In the presence of nature a wild delight runs through the man…. In the woods, too, a man casts off his years, as the snake his slough, and at what period soever of life is always a child… In the woods, we return to reason and faith…. In the wilderness, I find something more deeper and connate than in streets or villages.” These celebrations square with our ready view of the Transcendentalists, who find in nature a beauty and a solace that restores to their souls to a kind of youthful beauty. But in fact Emerson aims to tell a deeper philosophical story. For Emerson, nature is not an object external to us that we enjoy as passive spectators, but an active force tangled up in our lives and minds. Emerson views nature as Kant viewed space, time, and causality, or as Hegel viewed reason’s presence in human history: namely, as a transcendental condition for human experience. Transcendental conditions make our experience possible by providing the requisite structure and the categories. Nature, for Emerson, is projected by the soul upon the world, as the soul shapes and prepares the world to be experienced by us. “We learn that the highest is present in the soul of man…. that spirit creates; that behind nature, spirit is present; …. therefore, that spirit, that is, the Supreme Being, does not build up nature around us, but puts it forth through us, as the life of the tree puts forth new branches and leaves through the pores of the old.” Nature, as he claims near the end of the essay, is the house every spirit builds for itself. Kant and Hegel were able to make sense of their own transcendentalisms by separating our known, empirical selves from some more profound, less obvious Self – and Emerson makes the very same move. “We lie in the lap of immense intelligence, which makes us receivers of its truth and organs of its activities.” This comes in an essay entitled “Self-Reliance,” which is less about any form of radical individualism than it is about relying upon a Self that transcends any familiar object revealed in our ordinary lives. The beauty we see in nature, the nobility seen in the acts of great men, the wonder captured by the poet – all these are actions of a great unknown self that animates us and all the events we experience. Behind all of our actions, collectively, “there is a great responsible Thinker or Actor working wherever a man works; a true man belongs to no other time or place, but is the centre of things.” That is the self on whom we are to rely. Nature, God, Man: for Emerson these come to mean the same thing. As much as he seems to marvel at the shimmering beauty of surfaces, that shimmer is generated by an inner divinity to all things, a divinity that is sensed and approached by turning one’s attention away from society, away from the demands of others, away from institutions, and even away from books and learned discourse. 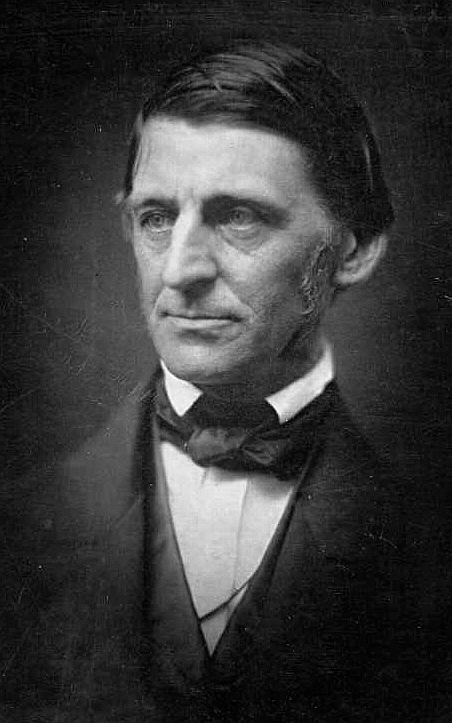 In that early essay on nature, Emerson finds a treasured solitude by letting all the particulars surrounding him merge into a fluid whole: “Standing on the bare ground – my head bathed by the blithe air and uplifted into infinite space – all mean egotism vanishes. I become a transparent eyeball; I am nothing; I see all; the currents of the Universal Being circulate through me; I am part or parcel of God. The name of the nearest friend sounds then foreign and accidental: to be brothers, to be acquaintances, master or servant, is then a trifle and a disturbance. I am a lover of uncontained and immortal beauty.” As the transparent eyeball, even “mean” egotism vanishes: Emerson himself disappears into his own field of vision. Emerson does not have the temperament to systematize this felt union with a divine universe into any sort of explicit system. Words and concepts fail. And this is what separates Emerson’s approach to nature from Spinoza’s. While Emerson believes that only the heart or the soul can reveal the nature of nature, Spinoza thinks that the principle of sufficient reason, if applied with strict rigor, can teach our understanding that there is and can be only one substance in existence, call it “God” or “Nature” as you will. Reason teaches that it is conceptually possible for there to be a substance with all essences; but then no other substance can exist without being essentially identical with it. So there is but one substance, and every particular thing in nature is only a mode or expression of it. But while Emerson sinks into transcendent nature as one might sink into a cozy armchair, Spinoza believes that the one nature is coldly and harshly indifferent to us. One cannot love God in any passionate way; at most, one can marvel at nature intellectually, in the way one might behold an elegant theorem. Emerson enters the untouched, tangled forest to lose himself and gain his oneness; Spinoza loses himself through elegant structures of geometrical demonstrations. Emerson’s heart finds its home, as does Spinoza’s head; but the two homes are miles apart. One suspects, though, that Spinoza also wanted to find some way to bring along his heart to the Grand Central Station. He allows a third kind of knowledge, one that lies beyond experience and reason. “We feel and know by experience that we are eternal,” he writes toward the end of the Ethics, and he is referring to a mystical experience that is not clearly different from Emerson’s. Somehow, through a direct intellectual apprehension of our own nature, we feel our union with God, and in this feeling resides the mind’s greatest blessedness. It is something of a relief to find this in Spinoza, as every brain requires a heart to pump blood to it. If Spinoza had not opened up an opportunity for this mystical union, we would be left wondering how any philosopher could be motivated to work through all of the previous demonstrations of the Ethics. He seems to want his heart and head to tell him the same thing – though it is not clear he can have it both ways. As each of these philosophers abandons the notion of nature being designed for our sake by a transcendent being, they must arrive at some notion of nature’s own essential nature, and fall back upon it as theists fall back upon the inscrutable will of God. Emerson’s nature is warm, trustworthy, and welcoming; Spinoza’s nature is cold, aloof, and indifferently necessary; Nietzsche’s nature is a dangerous and thrilling invitation to greatness. Mark Twain once wrote that, after God created man in his own image, man quickly returned the compliment. If that is a just accusation, it is no less just when aimed at these three brothers as they go about discovering or inventing their own natures. Nietzsche’s entire philosophy was a self-rescue operation. He needed some intellectual means to overcome his constraints (sickness, mortality, oblivion) and attain a feeling of triumph. What he prescribed for judgments in Beyond Good and Evil also describes the point of his own philosophy: “The question is rather to what extent the judgment furthers life, preserves life, preserves the species, perhaps even cultivates the species.” It is obvious then why Nietzsche should conceive nature as an ongoing challenge, a contestation: he felt it was precisely the view he needed in order to transmute his own suffering into victory, and his everyday efforts into a campaign. Oddly, Nietzsche’s prescription falls flat upon comfortable lives. I cannot see each day as a struggle unto greatness. If there is any challenge at all, it is to survive long hours of banality. Or have I not heard Nietzsche’s challenge? Should I make my life more dangerous, as he recommends in The Gay Science – “Build your cities on the slope of Vesuvius! Send your ships into unexplored seas! Live in war with your equals and with yourselves!” – and invite instability into it? What would that mean? Presumably, it would first entail a great deal of self-knowledge and self-diagnosis: what do I avoid? What makes me afraid? What holds me back? Where am I weak? I would then find ways to challenge my deficiencies and limits, and set nature forth. Zarathustra tells a parable of the camel becoming the lion becoming the child – so my true birth requires first a burden followed by a destruction. I must learn what weighs me down, and then annihilate it with the ferocity of the blond beast. 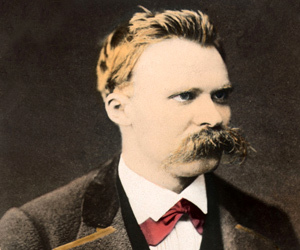 Only then will I be a free spirit – and possibly, have I the strength, an übermensch. But why would this mode of life be better than any other? By what right does Nietzsche offer any “Thou shalt”? In Twilight of the Idols, Nietzsche argues that he has backed up to the widest perspective possible – that of life – and the values he celebrates are its own values. Still: who cares what life thinks? In the end, Nietzsche’s only answer is that he cares. Again, his task is self-rescue, and he is saying what he needs to hear. At times this seems to be precisely Nietzsche’s point. He knows himself well enough to know that he is not the model for all. But perhaps he is a model for some. He hopes for “friends,” or souls that resonate on his frequency. Nietzsche is unique in this regard. He is trying to get past the philosophical desire to craft a metaphysics for all, or a single scheme by which all lives should be ordered. He does not always succeed, and for someone trying to get beyond good and evil he is often more judgmental than the most earnest moralist. But at other times he is self-conscious of his own perspective and seems to realize that his nature is indeed only his nature. Emerson and Spinoza, in contrast, tell us what nature is and how we should live with it. This is clearest in the case of Spinoza, whose Ethics lays out the necessity of his metaphysics. His advice for us comes in two pieces. First, we should be aware that, as modes of God’s own power, we strive for long and happy lives. If we are not overwhelmed by passions and illusion, we can strategize and develop for ourselves lives of greater and greater stability and self-determination. As circumstances permit, we can bond together with other individuals and secure for ourselves the liberty to philosophize, i.e., the freedom to pursue greater knowledge of ourselves and nature. But – alas! – conditions often to do permit such freedom. Humans are usually slaves to ignorance and passion, and this is where Spinoza’s second piece comes in. We need know that we are modes of an eternal substance, from whose nature each and every thing follows with the same necessity as it follows from the nature of a triangle that its angles are equal to two right angles. This realization by itself can help us to maintain equanimity even in the face of death and destruction. So: increase your self-determination where possible, and where not, strive for an eternal perspective. It is telling that each of these brothers must posit a higher self – an oversoul, a sage, or a free spirit – that provides spiritual direction in the vacuum left by an absent deity. They would all insist, however, that the vacuum is in no sense recent. It has always been there, and we have only at times confused our own potentials for a being distinct from us. But a mean egoism, or letting our shallow desires determine our lives, will not sum up to any significance. We must reach beyond our lives to find our true selves, and only then will we have found how to live. “Whoso would be a man, must be a nonconformist,” Emerson insists. And the three brothers agree: the enemy is conformity, or an unthinking acceptance of societal, spiritual, and moral norms. They would furthermore agree that the main “boss” to defeat is institutional Christianity, as it has proven constrictive and deadening. In fact, this problem would not be so serious were it not for the fact that such widespread, ignorant superstition commonly leads to political structures which are as tyrannical and violent as an ill-tempered child. This is the second problem with institutionalized religion – namely, its institution. If the religious imagination could be restrained so that it only told humans to be nice to one another and love God above all, then an institutionalized religion might be very welcome. (It was to this end that Spinoza wrote his Theological-Political Treatise.) It would at least keep the peace among ignorant people, and allow philosophical sages to conduct their metaphysical dialogue in a free and open space. In his Treatise, Spinoza tried to guarantee social leaders that the philosophers would be smart enough not to let their speculative inquiries disrupt the public peace, since that peace is requisite for their own modes of life. In this he failed, and surely would have met with public censure – and maybe corporeal punishment – had he not died young. Emerson’s complaint about traditional Christianity is just the opposite: its problem is that it is not imaginative enough, not passionate enough. The young men in divinity school were being trained to see the revelations of the Bible as old news belonging to people dead and gone. But Emerson claimed that no religious teaching is valid unless I deem it so – “It cannot be received second hand. … Let this faith depart, and the very words it spake, and the things it made, become false and hurtful.” In Spinoza’s eyes, Emerson would seek to make all religious believers as wide-eyed and overzealous as the irrational prophets of old. But Emerson trusts that the spirit infusing all humans would temper each prophesy to a blandly gentle and generic ecumenism. If Emerson could somehow guarantee this, Spinoza would commend his new awakening. But history suggests that religious enthusiasm is rarely Emersonian. For Nietzsche, the question “Who is the enemy?” provides the great impetus for nearly all of his works. Who is not the enemy? Women, Germans, the English, anti-semites, and above all Christians are the ones to blame for the stagnant swamp of life and culture in which he found himself. What all of these enemies have in common is a certain fear of nature. The early Jews found the natural barbarism of the Greeks fearsome, so they enslaved the barbarians to a set of laws extolling mercy, lowliness, gentleness, and humility. The Christians built a lasting society around these slavish virtues and directed an even greater quantum of natural energy against nature itself, producing a cultural asceticism. These ascetics became priests and scholars, who have all worked steadily at the project of repressing natural forces. The enemies are the ones who say No to nature; the heroes, the ones heralded by Nietzsche’s philosophy, will provide a great No to this No, the Great Double Negative which turns into a giant Yes to what we can become, once freed from ideological enslavements. Emerson would be shocked at what this might entail; Spinoza would be shocked the Nietzsche could look forward to such upheaval; and Nietzsche would reply to both of them that tranquility is not what we need, but rather war. But our three brothers agree that institutional religions have had the paradoxical effect of turning us away from what is divine. Spinoza would say that religion clouds our reason, and thus hides the nature of the one substance. Emerson would say that religion teaches us not to trust our own connection to the divinity surrounding us in every experience. Nietzsche would say that religion only represses the soul’s own capacity for greatness and nobility. The institution whose explicit aim is to direct us to God in fact deadens us to what is truly divine. Our age is one of philosophically-unreflective naturalism. Our naturalism is a seemingly inevitable consequence of our tremendous scientific understanding. While we can always count on there being faith-healers and miracle-mongers, they are being steadily beaten back by advances in our understanding of the world. Institutions of religion, by and large, seem to follow Spinoza’s advice as science progresses: they become less and less tyrannical until they are left offering only kind words and solace to those who are troubled, a social process which might be termed the “Hallmarkification” of religion. The “philosophically-unreflective” qualifier might also be a consequence of scientific understanding. Scientific progress requires working within a largely unquestioned paradigm. We accept a vision of nature as an impartial, vaguely law-governed system, and we accept our role in it as one of its minor components. Questioning the foundations of that vision does not yield faster CPUs, nor more accurate accounts of how sea horses reproduce. Advancing scientific understanding requires philosophical blinders. Curiosity must be contained within a certain predictable range. But at the same time, it is also true that not everyone in our society is in the business of advancing scientific understanding. Indeed, most of us are not, and we have the remarkable leisure to engage in all manner of curious inquiry while enjoying the fruits of science. But for some reason this is an opportunity few of us take. Some of us are too busy chasing the glittering nothings that dance around us. But some of us are intellectually hungry for bigger visions or interesting philosophical possibilities – and yet we find nowhere to turn but science. Perhaps this is the result of the emphasis we place on science education in our society, which too often comes at the expense of learning what universes exist within the human soul. It is here that our three brothers can do something for us. All three turned their back on any pre-scientific religious metaphysics. They may have had criticisms to offer about taking science as an oracular guarantor of truth – especially Nietzsche! – but they all favored explanations based upon scrutinized experience and disciplined inquiry. And yet all three also found something in nature that filled their imaginations with exciting possibilities. What they found was not just more nature to be understood through science; it was instead a spiritual possibility, a source of value, meaning, and direction. It might even be called an unnatural component of nature, to the extent that grappling with it required philosophy rather than science. There was a reason none of these philosophers were scientists: what interested them, what lit them on fire, were questions and problems lying outside any scientific framework. It is telling that today we can wonder whether anything lies outside any scientific framework. We are tempted to try to explain Spinoza through his historical origins, or Nietzsche through his biography, or Emerson through 19th-century social phenomena. We immediately seek to tame and naturalize these thinkers, and we hope their thoughts will be naturalized with them. But they stubbornly insist otherwise. They insist that, while we can indeed mount natural explanations, there is always something driving us, something compelling us, that we are in that moment ignoring. They call it nature, and just as they criticized institutional religion for directing us away from the divine, they might also criticize institutional science for directing us away from nature. The sort of nature they have in mind is something we discover through our own thinking and through our own assessments of what we are and what we mean. Of course, none of this is to say we must become Spinozistic or Emersonian or Nietzschean, if any of those things are even possible for us today. But the presence of these thinkers, confronting the issues still with us, encourages us to dare to think philosophically, and to become philosophically-reflective naturalists. There are many dimensions to being human, and only some of them can be articulated in scientific paradigms. For the others we have music, art, literature, and philosophy. Living and thinking while leaving those dimensions unexplored is like learning to dance without music, or praying to an empty cathedral. Our three naturalists encourage us to live up to our possibilities, and to see whether we too can discover divine riches within our souls. This entry was posted in Books, Historical episodes, Meanings of life / death / social & moral stuff, Nietzsche, Spinoza. Bookmark the permalink. Great essay, Dr. Huenemann! Thanks!